Are you still searching for methods to get more NBA 2K17 VC or MyTEAM card? You are on the right place. Today we'll be straight to the point and give you a nice and easy solution to deal the problem. Once you have an active Amazon Prime account, you can start a free 30-day trial or link your account to Twitch Prime to get these free goodies. After log into Twitch Prime, you will see a "Free With Prime" menu on the left hand side of the Twitch landing page with your reward. Then the Locker Code filed under the crown-shaped "Prime Loot" icon at the top of the page. Then redeem the rewards by entering the Locker Code you received through the Options/Features section in NBA 2K17. 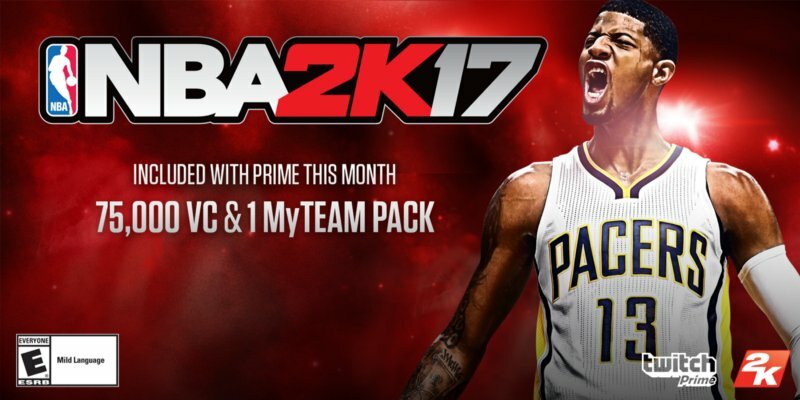 Remember that the Twitch Prime Locker Code can only be used once per MyTeam account. Are you a Twitch Prime member? Today is the day to get your awesome in-game loot for NBA 2K17!